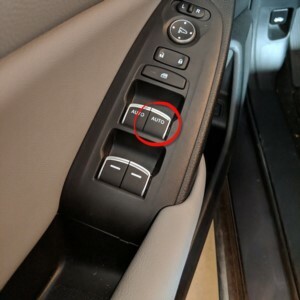 For the past few months, I've noticed that one of driver's side door buttons that controls the window would intermittently stop working in my 10th generation Honda Accord. The fact that the issue is intermittent is what makes it most annoying. As a driver, I would often times roll down the window to talk to someone, and then suddenly not be able to roll it back up. I would have to lean over and use the passenger door window button. The actuator in the window itself still works because the passenger side window button properly operates the window. And from the driver's side, the other three windows can be controlled without any problems, so it is not an issue of the windows being locked. So I have an early morning appointment to leave my car with my Honda dealer in Burlingame, CA (Ocean Honda of Burlingame) to take a look at the issue. Thankfully, they offer rides back home/work, so I could get home on that long MLK weekend. At the same time, I had them take a second look at the airbag indicator light. I around 5pm the same day, the car is ready to be picked up, and thankfully the window is working again from both the driver's master switch and the passenger door. The service rep didn't mention how they fixed it. TLDR: Passenger window problem showed up again. There are this odd screeching noise as I accelerated, but not while braking. I had to roll down the window while driving to evaluate what was going on. I coincidentally open both front windows. And to my surprise, the passenger window is exhibiting the original problem, less than 24 hours later! TLDR: Reported the same issue, but I actually went to the back where they showed me how to manually "reset" the window control. Still no permanent fix. After a separate appointment ended early, I brought the car into the Ocean Honda of Burlingame to take passenger seat measurements for the passenger air bag issue. Since I have the mechanic during that car diagnosis, I mention to him the window stopped working again. Apparently, the window can be reset by rolling down the passenger window all the way down, then continue holding the window down for 3 full seconds. Then rolling the window all the way up, then holding it up for 3 full seconds! This sort of "reset" leads me to believe the issue is an electronic issue. The issue has started up again, only 4 days after being "fixed" at the Ocean Honda of Burlingame. I called the dealer to let the mechanic know the issue. We'll just wait and see what they say. UPDATE: Honda Service Rep at Ocean Honda of Burlingame never got back to me. TLDR: Other than maintaining a record of what's happened, American Honda Finance Corporation call was not able to offer much more than suggesting me to try another Honda Dealer. They can't look up records from other vehicles having the same issues. After a call and opening a ticket with American Honda Finance Corporation, they suggested I try taking my car to another dealer. In this case, I found that the Honda Dealer in Colma, CA had Saturday service hours. This way, I could drop my car off Friday evening, scheduled for the first Saturday morning service appointment. This gives me the best chance of getting the car back sometime Saturday. So I had the Colma Dealer (Honda of Serramonte) look into this issue. I explained that the Ocean Honda of Burlingame had looked at it without success after resetting the window at the passenger side control. They said "No Problem" and I left them to diagnose the problem. The next morning, I got a call saying my car was ready. A quick test at the dealer showed the sure enough, the window was operational. I signed off on all the documents and drove off. At literally the first light, I try the rolling down the passenger window from the master switch (on the driver's side) again only to find it has stopped working again. I immediately make a U-turn and head back to let them know it wasn't working. Since the rest of the Saturday was unavailable, they asked me to make another appointment, which I made for the following week. Super disappointing! TLDR: Determined it was a window actuator malfunction. Would need to be replaced under warranty, but part needs to be delivered. This time, when I dropped off my Honda Accord, I reminded them of previous situation (I understand that the service reps see car after car) so they could note it for the technicians. Again, the wait for the next day. This time, I got a call back and their fairly sure the problem is the passenger side actuator. They don't have any on hand and the earliest they can get it is in 2 business days. Alright, I figure I could do a third drop off to Honda of Serramonte, since they had proposed a new fix. I dropped the car off the night before to at Honda of Serramonte to replace the window actuator. Upon pickup around 11am, I signed off on all the paperwork (no payment since it's covered by warranty). I step into the vehicle and learning from last warranty visit, decided to test the window before I drive off the lot. To my amazement and the amazement of the Honda Service Rep, the controls were already not working! Since their schedule was full, he asked me to bring the car back the upcoming Monday (in 2 days) when they would get me a rental while they further diagnose the issue. I left work a bit earlier to drop off the car. Since they put me in an Enterprise rental (which the dealer is reimbursed by Honda Corporate for special circumstances), I didn't have to hassle my wife to also leave early to pick me up. The ETA on when my car will be available is unknown, but will update when complete. Everything I like and dislike about the 2018 Honda Accord (10th Generation).